N4KGL - RaDAR: What does Sputnik have to do with it? What does Sputnik have to do with it? While we are talking about beacons, Sputnik's four whip antennas formed an angle of 70°. Two were 2.4 meters long and two were 2.9 meters. The radios transmitted a signal that alternated between 20.005 MHz and 40.002 MHz, spending 0.3 seconds at each frequency. If the whips were used in pairs the short set would have been resonate at 29.5 MHz and the long set at 24.5 Mhz. I'd love to see the hookup. 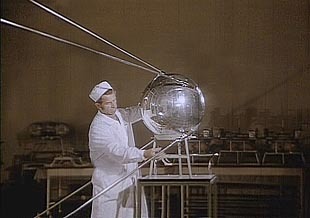 Learn more about Sputnik and the role Ham radio played at this link.